Pease Park Conservancy is thrilled to announce the release of the design plans for Kingsbury Commons, as envisioned by Austin-based Ten Eyck Landscape Architects, Inc. (TELA), who will lead the design and construction for the southernmost 13-acres of Pease Park. Pease Park Conservancy is thrilled to announce the release of the design plans for Kingsbury Commons, as envisioned by Austin-based Ten Eyck Landscape Architects, Inc. (TELA), who will lead the design and construction for the southernmost 13-acres of Pease Park. Pease Park Conservancy and TELA teams are working in partnership with the City of Austin Parks and Recreation Department on the designs which enhance the park to better serve the needs of Austinites, and creates an activated hub of play and community, while protecting the natural landscape of the beloved park. The vision for Kingsbury Commons channels its place as the recreational heart and cultural soul of Pease Park and aims to enrich the area by infusing it with additional opportunities for play, fitness, activity, and connections among people of all ages, while respecting the natural green space. Protecting and preserving the natural feel of this cultural landscape is a key component of the mission of Pease Park Conservancy and of Ten Eyck’s plans for Kingsbury Commons through the use of indigenous and sustainable materials throughout the project. Architects, Clayton & Little Architects, will adapt the historic 1920’s Tudor Cottage into a community gathering and event space. In addition, a new gracious stone terrace to the north of the cottage will expand the space available for community use with a view to a daylighted spring and woodland beyond. The creation of a new multi-use facility, just north of the Tudor Cottage, to serve as a hub for park volunteer activity, also designed by the Clayton & Little team. The new structures will house modern restrooms, storage, and additional picnicking space to supplement the park’s overcrowded existing picnic facilities and concrete block restrooms. Innovative recreational and educational play pod or “treescape” inspired by the native species and trees of the park, designed by Mell Lawrence Architects. The creation of new children’s play areas, along with a dedicated age-specific play section for preschoolers and young children may include nature-based playscapes, like stumps and wooden beams for climbing, plus, the addition of new swing sets and slides. New state-of-the-art waterplay feature and splash pad with arcing and pop water jets that will be about three times the size of the existing splash pad. A new basketball court, volleyball courts, and inviting entrance on the eastern side of Shoal Creek to welcome all of Austin to Pease Park. An interpretive stone ribbon that winds throughout Kingsbury Commons, connecting the diverse activities of the area, and offering a place to highlight the ecology and the long history of Pease Park in Austin. Clear wayfinding and informational signage to increase awareness of elements within the park, with attention paid to the park’s historical and cultural heritage. New built-in bike racks and benches, along with the restoration of the historic picnic tables. Enhancing the experience and increasing accessibility of the entrance and gateway into the park at the intersection of Parkway and Kingsbury with native landscaping, new sidewalks, and changes to the parking lot. Improvements to the plantings and natural landscape, likely including the addition of rain and pollinator beds, built-in meadows, wildflowers, a woodland understory, and substantial native flowering tree grove along Lamar Boulevard. 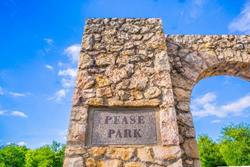 Prime Consultant / Landscape Architect – Ten Eyck Landscape Architects, Inc.
Pease Park Conservancy was formed in 2008 and is dedicated to the rehabilitation, beautification, and support of Pease Park, one of Austin’s oldest public parks and iconic greenspaces. Unfolding across 84 acres, Pease Park is a series of connected greenspaces running along Lamar Boulevard from West 15th to West 31st Streets, providing residents and visitors alike with an intimate, yet sprawling, natural amenity. Owned by the City of Austin, Pease Park is a public park maintained, operated and programmed by Pease Park Conservancy, in partnership with the Austin Parks and Recreation Department. About Ten Eyck Landscape Architects, Inc. Since 1997, Ten Eyck Landscape Architects, Inc. (TELA) has connected the urban dweller with nature and each other through civic, institutional, commercial, residential, and mixed-use urban infill landscape architecture projects. Recognizing the complexities of this endeavor, their collaborative sixteen-person team works closely with architects, engineers, ecologists, communities and clients to generate historically sensitive and socially, financially, structurally, and environmentally sustainable environments. TELA’s designs prioritize native plant communities, water harvesting technologies, and regional durable materials artfully expressed through form, color, and texture. From site planning through construction, TELA draws from extensive experience and intimate knowledge of the place to transform ordinary outdoor urban spaces into authentic, vibrant landscapes that stimulate the senses and unify communities.